Today, on 13 September 2017, 31 organisations are publishing an open letter. The letter calls for lawmakers to advance legislation requiring publicly financed software that has been developed for the public sector be made available under a Free and Open Source Software licence. Digital services offered and used by public administrations are the critical infrastructure of 21st-century democratic nations. To establish trustworthy systems, government agencies must ensure they have full control at the core of our digital infrastructure. Unfortunately, this is rarely the case today, due to restrictive software licences. The initial signatories of the letter include EDRi and its members Chaos Computer Club (CCC) and Wikimedia Germany, as well as Free Software Foundation Europe, KDE, Open Knowledge Foundation Germany, Open Source Business Alliance, Open Source Initiative, The Document Foundation, and many others. Public institutions spend millions of euros each year on the development of new software tailored to their needs. The procurement choices of the public sector play a significant role in determining which companies are allowed to compete and what software is supported with tax payers’ money. Public administrations on all levels have frequently problems sharing code with each other, even if they funded its complete development. Furthermore, without the option for independent third parties to run audits or other security checks on the code, sensible data and privacy rights are at risk. said Matthias Kirschner, President of the Free Software Foundation Europe. Because the source code of proprietary software is often a business secret, it radically increases the difficulty of discovering both accidental and intentional security flaws in critical software. Reverse engineering proprietary software to improve or strengthen it is an absolute necessity in today’s environment, but this basic technical requirement is unlawful in many circumstances and jurisdictions. With critical infrastructure such as hospitals, automobile factories, and freight shippers having all been brought offline this year due to flaws concealed within proprietary software, unauditable code is a liability that states can no longer subsidize with special legal privileges without incurring a cost denominated in lives. Right now, the blueprints for much of our most critical public infrastructure are simply unavailable to the public. 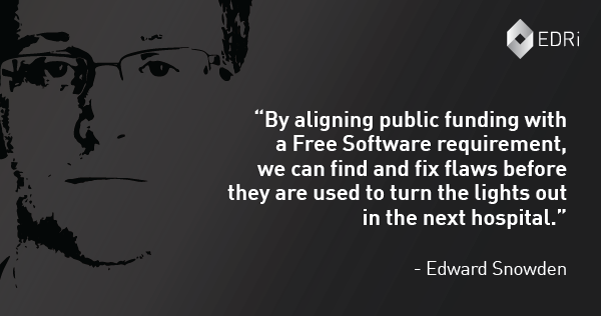 By aligning public funding with a Free Software requirement — “Free” referring to public code availability, not cost — we can find and fix flaws before they are used to turn the lights out in the next hospital. said Edward Snowden, President of Freedom of the Press Foundation about the launch of the campaign. The signatories therefore call on representatives all around Europe to modernise their digital infrastructure to allow other public administrations, companies, or individuals to freely use, study, share and improve applications developed with public money. This will provide safeguards for the public administration against the risk of being locked down to services from specific companies that use restrictive licences to hinder competition. Finally, it ensures that the source code is accessible so that back doors and security holes can be fixed without depending on only one service provider. The signatories ask individuals and other organisations to sign the open letter. It which will be sent to candidates for the German Parliament election and to EU policy-makers in the run up to the EU elections in 2019.